New York collector Alice Kandell, a Harvard Ph.D. and child psychologist, has made a dramatic enhancement to Atlanta’s arts scene. On loan through Nov. 27 at Emory’s Michael C. Carlos Museum is “Doorway to an Enlightened World,” through which compelling works of Tibetan Buddhist art are displayed not as individual, unconnected pieces but in their proper sacred context, regarded as a doorway into a higher world. Among the most impressive objects are large, gilt-bronze Buddhas and bodhisattvas dating from the 15th through the 18th centuries, a Mongolian silver Buddha with seashell and coral adornments, and a gilded bronze of the goddess Tara with a gem-encrusted crown. The paintings are framed within their original silk brocade, complete with the original finials. Author and media personality Robyn Spizman Gerson said, “My husband, Ed, and I attended Alice Kandell’s lecture at the Carlos, and it was amazing. She is a brilliant woman, devoted philanthropist, and has amassed a world-class collection. Her knowledge of Tibetan art is unsurpassed, and the spiritual essence embraces an exotic culture. The impressive craftsmanship of each piece embodies a culture few of us could even imagine. Jaffe: How did you get involved with this type of collection? Kandell: It’s very much a fairy tale story. When I was in college, my friend visited the tiny border country of Sikkim, where she fell in love with their crown prince and soon became queen. I went to their coronation (after pleading with my Harvard professors to grant me the time off). From that point forward, I was overwhelmed by the beauty, people, art and functioning of the Buddhist community. Fantasy became reality. Jaffe: Can you provide some of the history vis-a-vis your collection? Kandell: During the 1960s China destroyed much of the culture. As refugees fled, they could not carry artwork. During the Cultural Revolution, China demolished close to 6,000 monasteries and historical frescoes (dating to the 900s), extracted gemstones, and melted the gold. Remember, some of these shrines were seven stories high. The better news is the Chinese now know what they lost and are attempting to re-create new things from the old relics. But it won’t be the same. In 1975 India annexed Sikkim. Jaffe: Why Atlanta? Is this display going to other cities? Kandell: For two years it was at the Rubin Museum of Art in New York City. After Atlanta it will be permanently displayed at the Smithsonian. 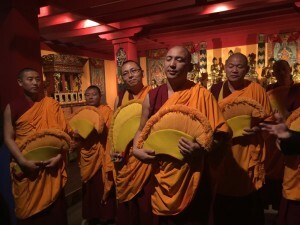 The Carlos, a gem of a museum, did a wonderful job during the opening with nine monks dressed in yellow, chanting and singing in a deep-throat overtone voice. It’s a special sound where they produce two notes at once. It was very moving and brought tears to my eyes. Note that monks have that vocal range because they had to communicate from mountain to mountain (laughing) before cellphones. 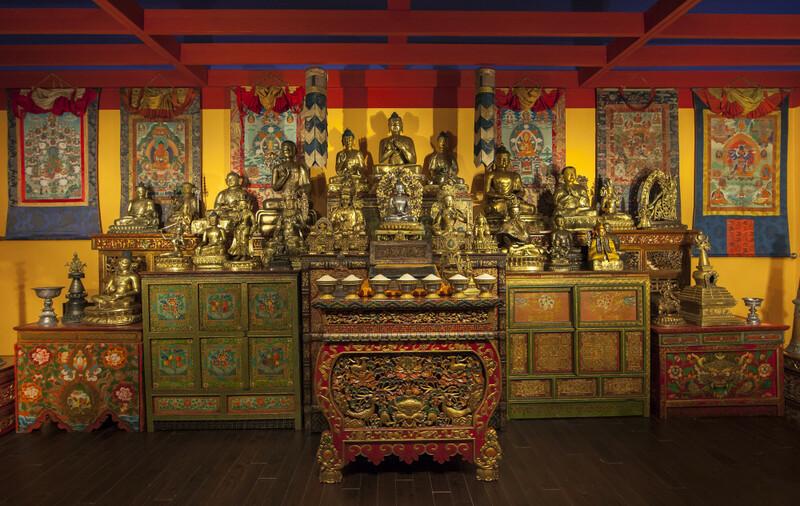 The Dalai Lama blessed many of the objects here and has a special relationship with Emory. Jaffe: Share with us how your photography interplays. Chanting and singing Buddhist monks help open the exhibition at the Carlos Museum. Kandell: The king of Sikkim gave me total access to document the country’s culture. For several years I bounced around on mules and in jeeps, which resulted in my two books: “Mountaintop Kingdom” and “Sikkim: The Hidden Kingdom.” In a way this was like Camelot. I donated the 300 original photographs to the Library of Congress. They are accessible online and part of the public domain. Jaffe: How does a Jewish woman process this kind of iconography not as an anathema to our Ten Commandments? 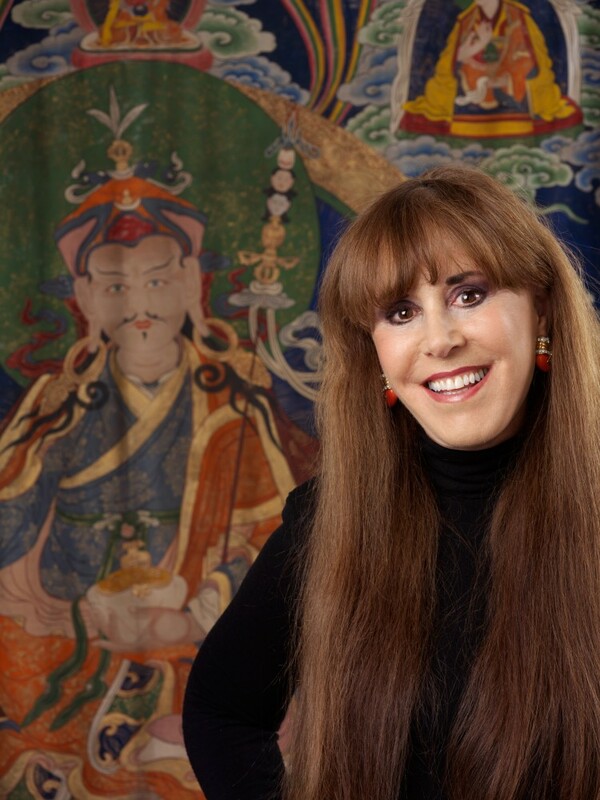 Kandell: I am Jewish, not Buddhist. The goal of Buddhism is self-enlightenment, which does not conflict with Judaism. These serene icons help people meditate and enhance one’s understanding of self and universe. I’m a collector of many things. Jaffe: What’s the extent of your collecting, and is it a fait accompli? Kandell: I had about 500 pieces and donated 250 to the Smithsonian, which built a room to display the art exactly as it was positioned in my dining room rather than individually on pedestals. By the way, it would have taken 10 rooms to display on pedestals. In terms of the future, hmmm … this is like an addiction to me. If my curator found the right piece, I’d go for it. Remember, this type of art does not belong to me or anyone. Jaffe: At what monetary value could the shrine room be estimated? Kandell: Let me think. What’s a sunset worth?